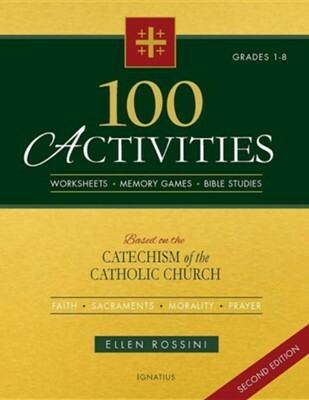 This second edition of the bestselling 100 Activities features more than 20 new and revised activities, including updates to English translations of the Creed and prayers of the Mass. Author Ellen Rossini has expanded the Primary section by adding lessons on the Mass and popular devotions including Eucharistic adoration and Divine Mercy prayers. As in the original edition, the worksheets, puzzles, Bible studies and games are based on the four pillars of the Catechism - the Creed, Sacraments, Commandments and Prayer. The activities require little preparation or materials and can be used to supplement any catechetical program for children in grades 1 through 8. Each activity is self-contained, perforated to tear out and reproduce for group use. Whether it is memorizing the precepts of the Church, understanding the Bible, or learning to pray, these exercises will enrich the faith of children and those who teach them, and help reinforce the lesson in a fun and effective way. I'm the author/artist and I want to review 100 Activities Based on the Catechism of the Catholic Church: For Grades 1 to 8, Edition 0002.